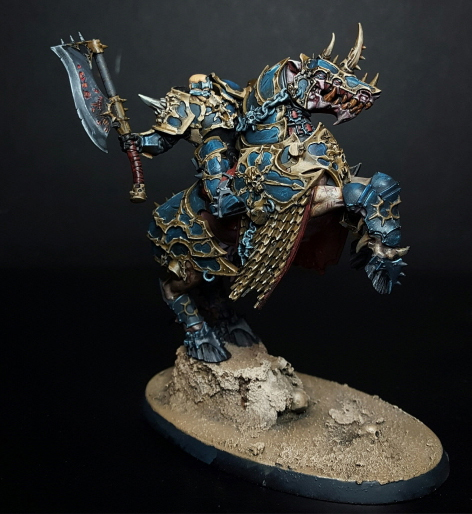 The Varanguard are always cool models to see painted well. They are so dynamic and detailed that they're really a painters dream. Blue and gold isn't a scheme you see often for them, but it looks really good here. 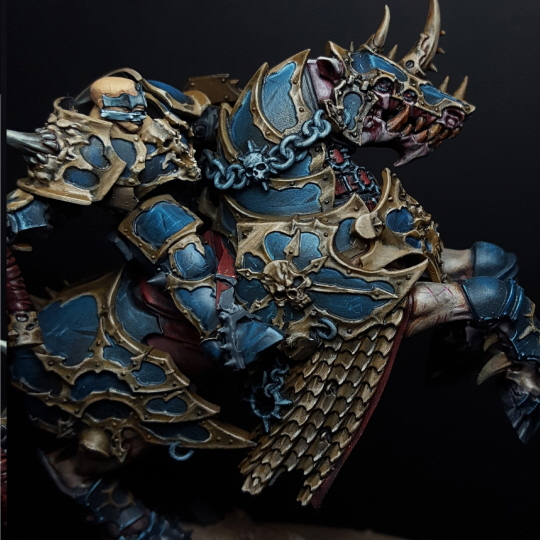 The way the blue is painted has a really gritty feeling to it almost, something that lends this guy even more credit as someone you don't want to mess with. It has just the right amount of reflections and scratches on it. The NMM (non-metallic metal) gold is really nice too and a hue of gold that I don't think I have seen before. The whole model has an almost painterly quality to how it was done. What I mean by that is it's not perfectly smooth like we see on a lot of other top quality models, but I believe this was done on purpose. You can still kind of see the brushstrokes here and there, but it's also still fairly smooth. The sickly looking flesh of the horse really helps drive home that it's not natural and contrasts well with the darker armor. The only part of the model that throws me a bit is the rider's skin. I'm not sure what it is, but it looks a little too saturated or something compared to the rest of the model. It's drawing my eye too much to it and I think would have been better served with something a little desaturated. The base is very simple, but the dusty color of it helps frame the model and keep your attention on it. Overall I really like this mini and would be interested to see the rest of the unit if they're painting them.